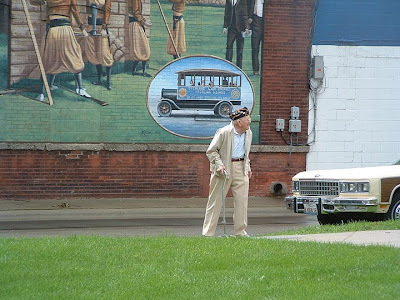 I took this photo at a Veteran's Day ceremony in the Town Square in Sterling IL, a couple of summers ago. The cars (and images) of cars are only peripheral, perhaps, but as always they give a sense of place and time, and make this composition by bracketing the Veteran in time. The Veteran displays a real sense of determination to keep pressing forward, even while honoring the past. The mural in the background is called "Sterling Lady Zouaves" and depicts a women's drill team that was organized in 1917. The originals Zouaves were a tribe of the Berbers - Algerian Arabs - who fought for the French, seeing extensive service during the French conquest of Algeria. Because they were "volunteers", the term Zouaves continued to be used to describe volunteer militias, especially in the Confederate states during the U.S. Civil War. A least some of these groups wore uniforms in the style of the original Arab Zouaves, which was one of their distinguishing characteristics. The Sterling Lady Zouaves, were formed in 1917, after World War I as something of a civil defense unit. Lady Zoauve units from around the state periodically competed in displaying their physical strength and skills like the wall-climbing which is depicted in the mural. Anyway, I really like the way the background forms a grid of right angle lines, and the Veteran is leaning forward with his head high.